What Is Communication & Its Necessity In Everyday Life? 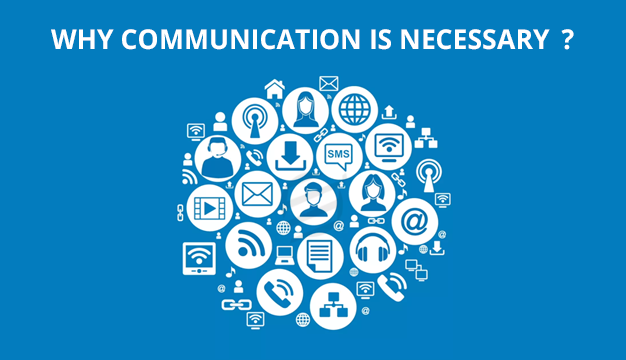 What Is Communication All About? Communication is defined as the medium of sending and receiving views and thoughts between two people or more. It is one of the most essential parts of our living. Without being able to communicate is a deficiency that shells a person into isolation. Communication is something that lets us express ourselves; it can be expressing our views or opinions on a subject, any information, any instruction, any feeling or any idea. When we communicate to someone, we let them get a glimpse of our personality. Hence, it can make both good and bad impacts on others. Verbal- Verbal communication is the basic form of communication. It is the communication where we use words to express ourselves. Verbal communication can take place during various situations like face to face conversations, televisions, radios, telephones, in class rooms during lectures or any scenario where we use our speech. Written- Written communication is where we convey and receive information in a written form. There are various means of written communication, some of which are letters, newspapers, emails, text messages, messages through various mobile applications etc. Written communication has become the most popular form of communication in what is commonly known as the information age. Expression and body language- Body language is also a vital form of communication. Body language and expressions are something which can convey our thoughts and decisions to other people. This medium of communication is often used when we are communicating with a stranger. Example- we can tell if a person is interested in a conversation through his body language and expressions, likewise we can tell whether a professor is impressed by our presentation through his gestures and expressions. We can even guess the way a person is going to behave or talk through his body language and expressions. A type of communication that also takes place when a father puts a protective hand on the shoulder of his daughter when she has to go into an exam hall or when a sister puts her hand on her sister’s when she is awaiting her results or a young person gives up his or her seat to an elderly on a public transport. These are the silent gestures that communicate respect, support and encouragement. And these silent little gestures are something that conveys humanity. Communication has its own barriers which prevents the sender to connect to the receiver and vice versa. 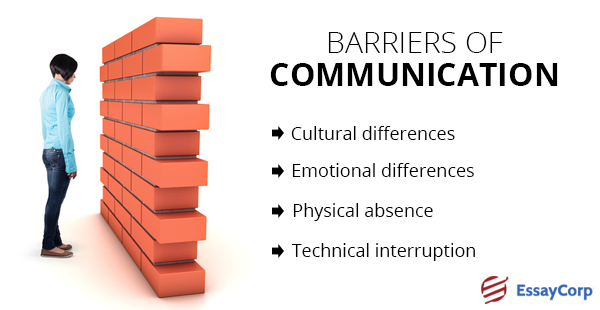 Cultural differences- This is the most common barrier in a communication. When people from different cultural backgrounds communicate, they often find it difficult to understand each other’s accent and way of forming words and sentences. They fail to convey their emotions and feelings through translation. Sometimes, translation even spoils the real meaning of the sentence or fails to convey the exact expression of it. Emotional differences- Sometimes people going through a situation – happy, sad or worse, fail to communicate their real feelings through words to an outsider. They lack the precise words that are required to make the other person understand their agony or elation. Similarly, a person not going through those situations, find it difficult to console or sympathize through words. Physical absence- Today though we have the best possible technology for communication, the physical absence still has its own disadvantages. The reader does not always understand the hidden meaning and emotion in a message sent to him. In the case of messages, the reader depends solely on the words. They seldom get to understand the real motive behind the message. So, the physical absence makes a conversation inadequate. Technical interruption- In today’s generation, technology has a lot to do with communication. We often find problems in our mobile or telephone networks which leave our conversations inadequate and incomplete. To understand or define the concept of communication, it is important to know its fundamentality. Communication is an important part of the human life. Communication has a lot to do with our regular well-being. If we do not communicate about what is bothering us or what should be done to improve situations be in work places or in home, our life becomes difficult. It is important to vent whatever we go through to somebody close to us. Communication plays a vital role in our everyday activities, be it to our colleagues, family members, or even to the shopkeeper that we visit. Letting people know your ideas your opinions is a very crucial aspect of living. Lack of communication in someone’s life can become the cause of many diseases. Know more Communication assignment example. To live a happier life, one must communicate. It can be through love, anger, fear or any other emotion. Whatever we feel, we must not confine them within ourselves. A well communicated conversation, using the precise body language, expressions and words can do wonders. The way we communicate to others, is what they perceive about us. So, working on our communication skills not only makes our everyday life easier but makes positive impacts to our character as well.